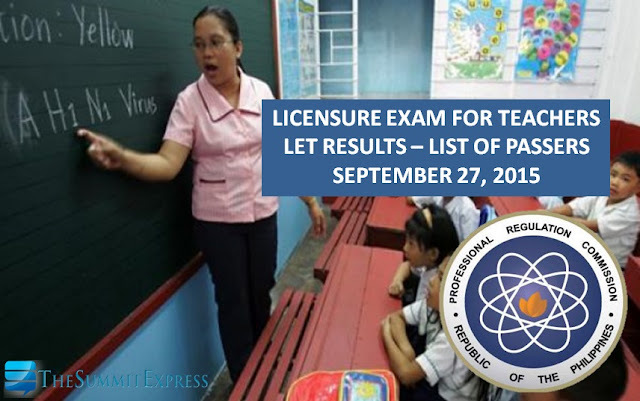 Those awaiting results of September 27, 2015 LET (Licensure Examination for Teachers) or known as Teachers Board Exam can find here the full list of passers out of 149,905 total examinees, top 10 (topnotchers), top performing schools and performance of schools as the Professional Regulation Commission (PRC) and the Board for Professional Teachers (BPT) released official results in 48 working days after the exam. The results of examination with respect to seven (7) examinees were withheld pending final determination of their liabilities under the rules and regulations governing licensure examination, PRC said. PRC administered the LET board exam in at least 25 testing centers around the country which include NCR (Manila), Baguio City, Cagayan de Oro (CDO) City, Cebu City, Davao City, Laoag City, Legazpi City, Albay, Lucena City, Quezon, Pagadian City, Zamboanga Del Sur, Rosales, Pangasinan, Tuguegarao, Masbate City, Virac, Catanduanes, Antique, Bacolod, Iloilo, Catarman, Jolo, Sulu, Tacloban, Tawi-tawi, Zamboanga, Occidental Mindoro, Oriental Mindoro, Palawan, Romblon and in Hong Kong. The dates and venues for the oathtaking ceremonies of the new successful examinees in the said examination WILL BE ANNOUNCED LATER, PRC advised. The September 2015 teachers board exams are consists of two (2) parts for Elementary: General Education (40%) and Professional Education (60%) and three (3) parts for Secondary: General Education (20%), Professional Education (40%) and Specialization (40%). To pass September 2015 LET, an examinee must obtain an average rating of not less than 75% and must have no rating lower than 50% in any of the subjects, PRC said. PRC Board News, our partner website for PRC exam results said that the probable release date of September 2015 LET exam is between November 6 (Friday) and on the last week of November 2015. The expected date excludes holidays on November 17 to 20 (APEC Summit week) and non-working days (Saturdays and Sundays). This is based from PRC Resolution No. 2014-874 which says that the target release of results is after 45 working days or on Friday, November 27, 2015. In August 2014 LET, official results were released in after 51 working days. A total of 25,301 elementary teachers out of 70,786 examinees (35.74%) and 26,767 secondary teachers out of 77,803 examinees (34.40%) have passed the one-day test. In March this year, results are out online after 38 working days. A total of 12,103 elementary teachers out of 44,144 examinees (27.42%) and 17,904 secondary teachers out of 56,596 examinees (31.63%) successfully passed the LET. In general, the total number of days before the release of results depends on the total number of examinees. Say for example, PRC was able to announce August 2014 LET in about 51 working days due to high number of test takers as compared to other test schedules with less than 100,000 examinees. Other factor that might prolong the agony of waiting is the bad weather conditions as the government is expected to suspend office works for the safety of PRC officials. Same with the previous LET examinations, TheSummitExpress will provide reliable updates before the release of results. Takers can expect the most probable or exact date of release on this page. November 4, 2015 Update: Reliable source says LET results are out SOON. Riddle 1: "If it will not be dragged by the APEC event in the Philippines, a pair and one sunrises from the day that the Lord has made, the teacher marches with the heroes in victory for a lifetime privilege." Riddle 2: "The summation of the countdown digits' digit is twinned; the summation of the day that the Lord has made is lucky." On Riddle 1, netizens guessed results out between November 23 to November 30 (Bonifacio Day). On next riddle, some says the summation (of the day the Lord has made) which pertains to 45 working days is lucky (number 9). November 11, 2015 Update: Dr. Carl Balita posted another riddle today which says: "Double the infinity towards the dawns and the privilege will shine upon your day, teachers." Most of those who commented guessed LET results out on November 16 or earlier than PRC target release date and before the APEC Summit. November 17, 2015 Update: Balita says LET results out in 'singular digit of dawns'. Many say the judgment day is near and possible to be next week (November 26 or 27). November 23, 2015 Update: LET results out VERY SOON? "LET the countdown BEGIN.The future is in your HAND! ", reliable source posted on Facebook. November 27, 2015 Update: Dr. Carl Balita shared "LET us be patient as this remains to be the month that the Lord has made." It means that LET results will not be out today but expected to released from November 28-30. The delay may be due to APEC Summit 2015 on which the government declared work suspensions in the public sector (including PRC). November 29, 2015 Update: "LET us all be ready...." Though holiday, results will be out on Monday? November 30, 2015 Second Update: LET results out!